“Ravenous” features twin M.A.N. 1050hp engines, with only 500hrs SMOH. 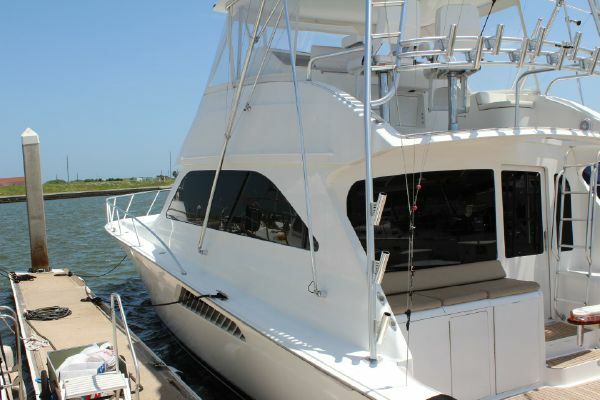 Equipped with an Onan 21kw generator, her hull is freshly painted, as well has undergone recent upgrades and updates. This vessel is tournament ready with items like: Release Marine Fighting chair, Rupp outriggers, Rod rocket launchers, complete electronics package, and much more! Custom items like, short aluminum bow rail for the “Palm Beach” look, “Baby Ostrich” custom headliner, upgraded decor package with rich tans, blacks, and browns. This vessel has three staterooms with the Island Queen Berth forward layout. Teak and holly sole in the galley, and heads along with teak accents throughout the vessel. 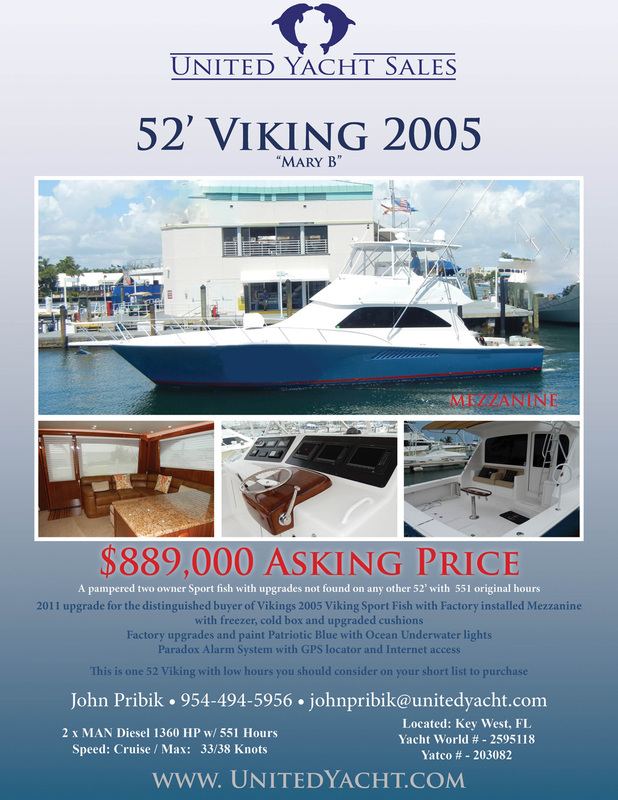 Call today to schedule your showing of this classy sportfish. Nyati has a three stateroom two head layout with galley up. 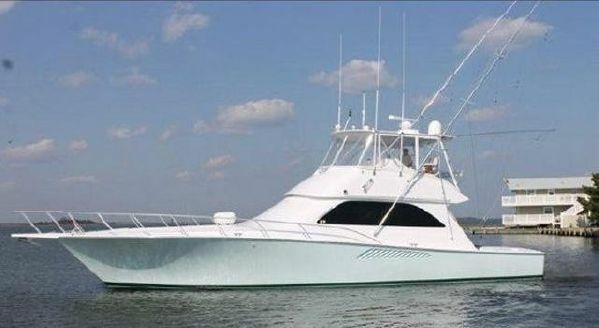 Over the last year she has had several upgrades to include all new Ray Marine electronics, 8 Ocean LED underwater lights with remote controller at helm, refrigerated fishbox, new Pompanette helms chairs and new Eskimo ice machine. 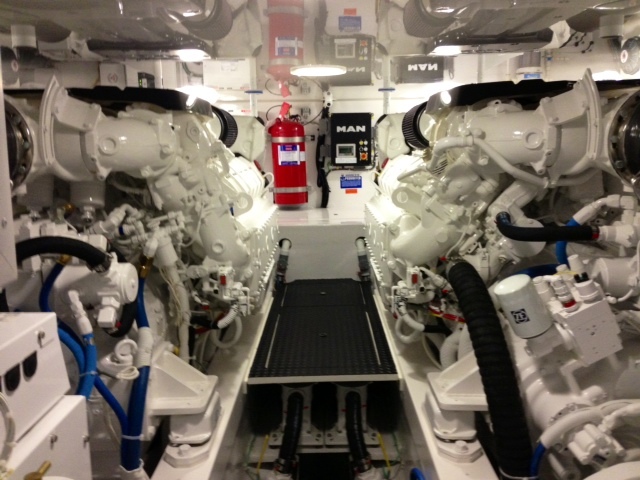 With Man 1300 HP diesel engines and 1400 gallons of fuel you can travel fast and far. New 52 Viking Introduced – New Pics Posted! 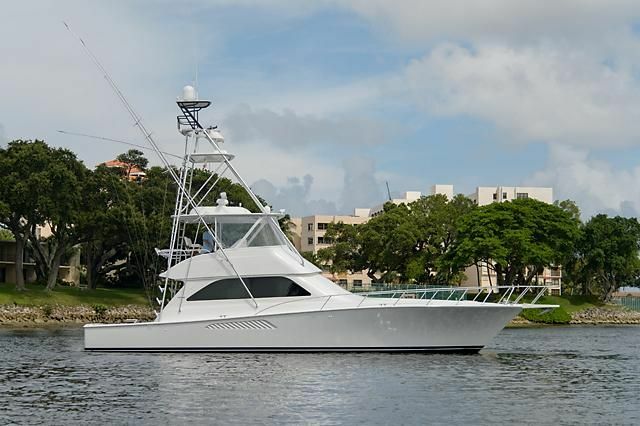 An impressive addition to our blue-water stable of tournament contenders, the 52 Convertible showcases leading edge design and benchmark engineering in the Viking tradition of excellence. Following in the evolutionary paths of the highly successful Viking 55 and Viking 62 Convertibles, this new convertible comes to the party with a finely tuned resin-infused hull and a running surface built for speed. 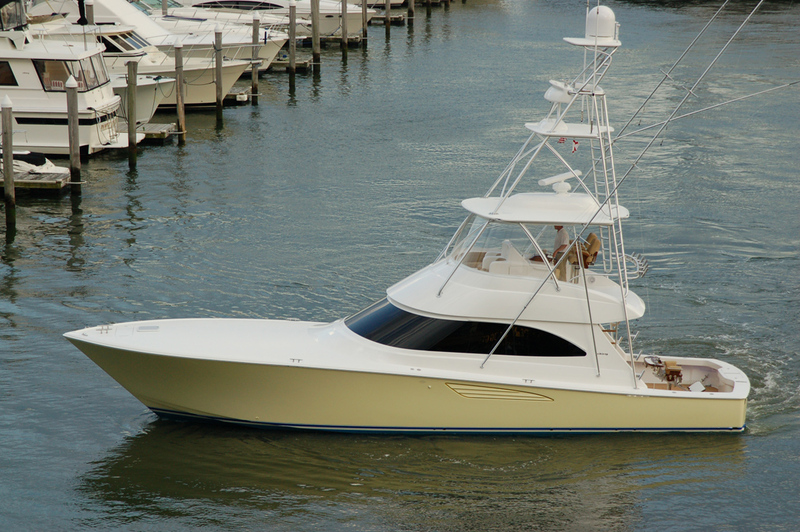 The sharpened entry and convex forward sections add buoyancy in a seaway for knifing through head seas typically encountered offshore, while the V-bottom tapering aft to 12 degrees at the transom utilizes horsepower efficiently for speed and to maximize range. Custom designed high-speed rudders deliver maneuvering agility and outstanding response at the helm, an experience to behold ripping along at better than 40 knots with MAN V12 1400 CRM common rail diesels. 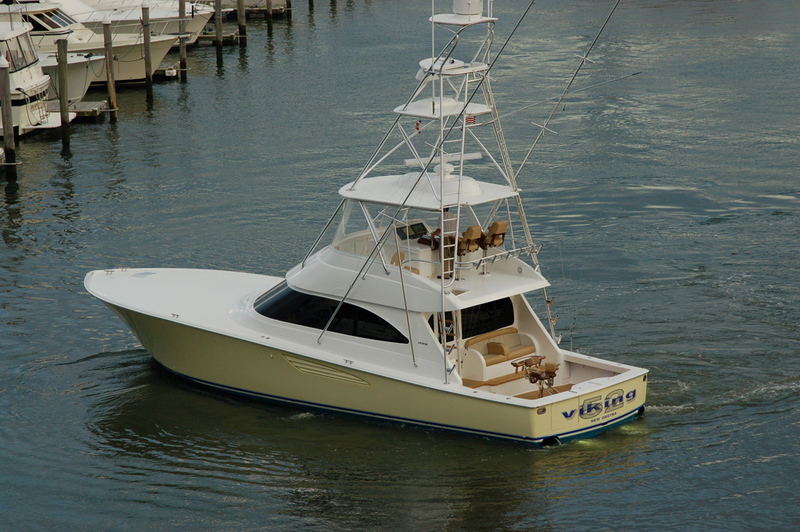 Intents was custom built by Viking Yacht Company for a knowledgeable and discerning owner. Careful monitoring of the build process by him, along with the stellar execution by the Viking Team produced the desired results. 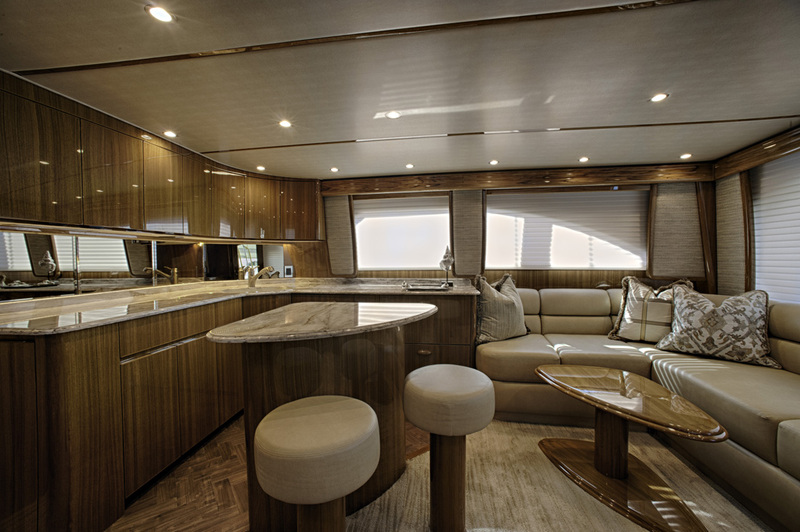 Some highlights include oval exhaust outlets, no exposed fasteners on flybridge, fiberglass side-thru hull fittings, awlgripped pumps, bilges, lazarette, intakes, along with an upgraded decor package. 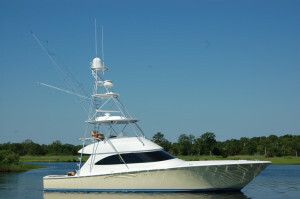 At delivery, she was outfitted with a custom Palm Beach Towers tuna tower and a custom electronics package. 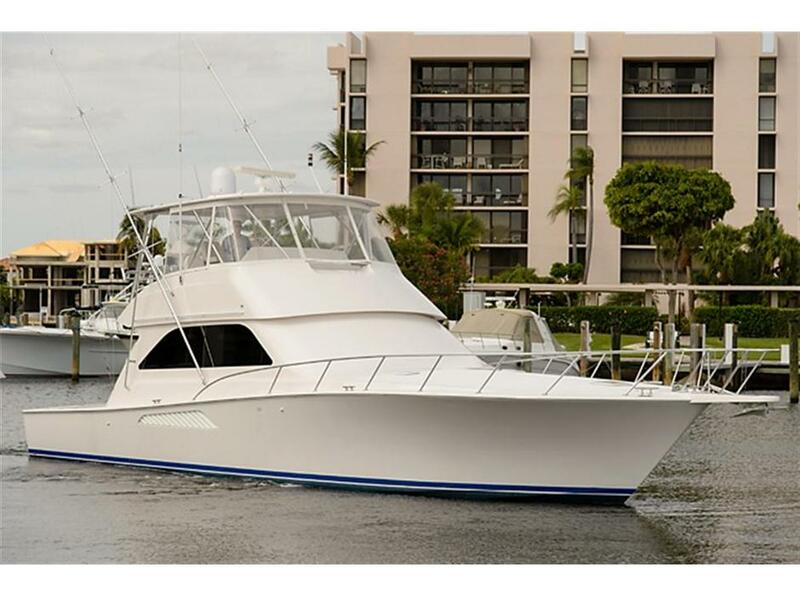 This beautiful 2007 model one owner, turnkey sport fisherman has enjoyed an excellent maintenance program and light family use.